Thanks to chutney being a true South African ingredient, everyone has a variation of this recipe. To make it lower in fat, but still yummy, yoghurt is used instead of mayonnaise. 2. 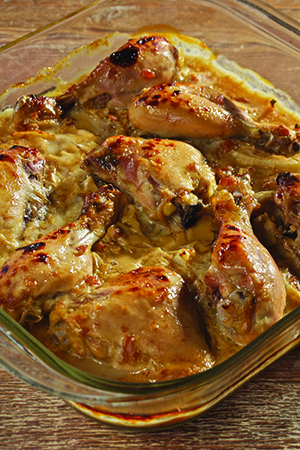 Place chicken and onion in an oven dish. 3. Mix yoghurt, chutney, juice, salt and cornflour paste and pour over the chicken. 4. Bake for 30-45 minutes or until golden brown and cooked. 5. Serve with small portions of brown rice or mashed potatoes with broccoli and carrots. 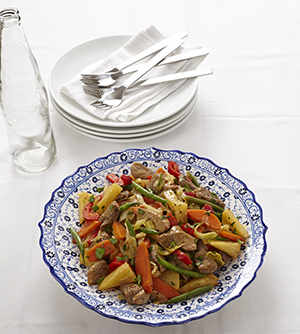 These recipes have been made available courtesy of Pharma Dynamics and the Heart and Stroke Foundation SA, and forms part of the Cooking from the Heart cookbook resource, which contains more than 100 heart-healthy recipes. 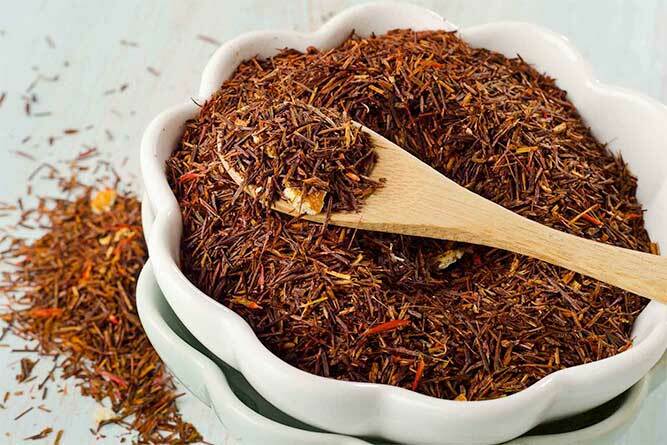 The selection above all include homegrown Rooibos which is sure to tantalise everyone’s taste buds. 1. Chicken: Heat the oil in a large frying pan over a medium heat and fry chicken on both sides until golden brown. 2. Reduce heat, add tea and bay leaf. Cover with a lid. Simmer for 20-25 minutes or until just cooked. Spoon out and allow to cool. (Freeze the pan juices and use as a stock for another meal.) Remove the bones from the chicken and shred the meat. 3. Salad: Mix mustard, lemon juice, sugar, oil and origanum and season with pepper. Pour some of this mixture over the chicken to marinade the cooked meat. 4. Pour boiling water over the broccoli or beans and peas. Allow to stand for 7-10 minutes or until cooked. Drain and repeat if necessary. Rinse well to cool. 5. 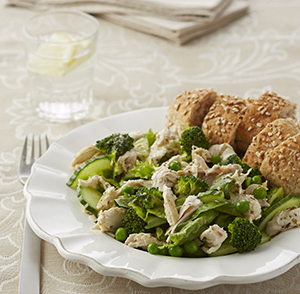 Toss the cooked veggies and chicken with cucumber and lettuce and serve with the remaining dressing. If you are packing into a lunch box, keep the lettuce and extra salad dressing separate until you are ready to eat. Enjoy with left-over cooked veggies such as butternut, sweet potato or corn or a slice of wholewheat bread. 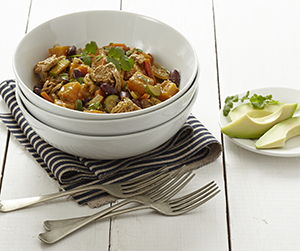 Tuna is a healthy and affordable source of lean protein and this meal is perfect to enjoy in a bowl – to warm you up. 1. Mix the coconut into the milk and allow to stand. 2. Heat the oil in a large pot over a medium heat and fry onions, carrots and baby marrows for a few minutes. 3. Add spices and butternut and fry until aromatic. Reduce the heat and stir in the tea or water with the chilli. Simmer with the lid for 20 minutes or until the veggies are just cooked. 4. Add beans, tuna with the liquid, coconut with the milk and salt. Simmer for another 5 minutes or until heated through. 5. Season with lemon juice and pepper. Stir in chopped coriander and garnish with more fresh leaves. 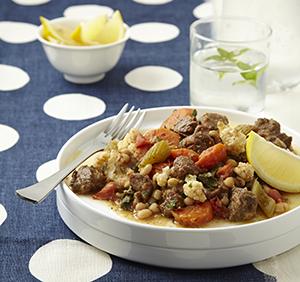 With the added lentils, and butternut instead of the traditional potatoes, you have a healthy winner. 1. Heat half the oil in a large saucepan and fry mince until brown. Spoon out. 2. Heat remaining oil in the same pan and fry onions, carrots and mushrooms until soft. Add mixed herbs, coriander, mustard, mince and tomatoes. Reduce the heat and simmer over a low heat, with a lid, for 20 minutes. 3. Add tea and lentils and simmer with the lid for another 15- 20 minutes or until lentils are soft. Season well with lemon juice and pepper. 4. Preheat the oven to 200 ˚C. Meanwhile, place butternut and salt in a pot with ¾ cup (180 ml) water. Bring to a boil. 5. Reduce the heat and simmer for 20 minutes or until just soft. Drain well and lightly mash or crush with a fork. Season with lemon juice and black pepper. 6. 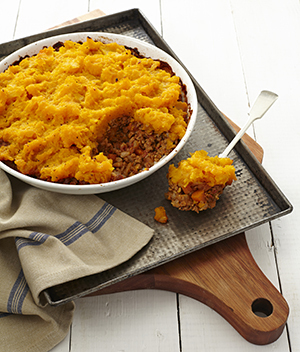 Spoon mince mixture into an oven dish, spread butternut on top in an even layer. Bake for about 20 minutes or until golden brown and heated through. Serve with green veggies like pan-fried or steamed broccoli and baby marrows, seasoned with fresh herbs and lemon juice or fill your plate with a tomato salad. 1. Heat oil in a large saucepan or pot and fry chicken until brown. Reduce the heat and add tea, bay leaf and lemon rind. 2. Cover with a lid and simmer for about 20 minutes or until cooked through, but not dry. Spoon out chicken and allow to cool slightly. Remove chicken from bones and shred meat. Preheat oven to 180 ˚C. 3. Meanwhile, mix yoghurt, cornflour and milk and add to the liquid in the pan. Stir over a low heat, until well combined. It may look like it has split, but don’t worry, the cornflour will bring it back together – just keep stirring. 4. Stir until it thickens and add rosemary and broccoli. Cover with the lid for 1-2 minutes to gently steam the broccoli. Stir in peas, salt and chicken. Season with lemon juice and pepper. 1. Mix cornflour with some of the tea to form a paste. Add remaining tea, lemon juice or vinegar and soy sauce and mix well. 2. Heat half the oil in a large frying pan. Fry pork until brown. Spoon out and keep warm. 3. Add remaining oil and stir-fry pepper, carrots and ginger for a few minutes. Add pineapple and fry for another few minutes. Add cabbage and stir-fry until just softened. 4. Stir in the sauce to coat the veggies. Add meat and green beans. Stir to heat through. 5. Cover with a lid for a few minutes to steam the beans. The beans should remain green and crunchy. Season with pepper, sprinkle with herbs and serve immediately. Serve with a green salad or some fruit. The veggies and pineapple add enough bulk to this dish and starch like noodles or rice is not necessary. 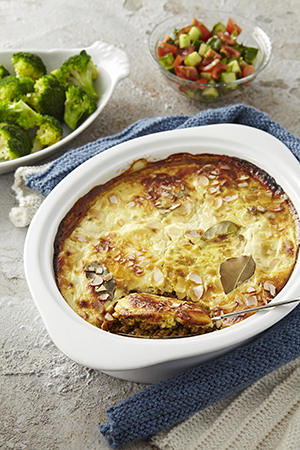 A typical South African dish, prepared as a vegetarian version. The sweet potato bulks up the recipe to make a filling meal, without the need for additional rice – especially when you need to control your carb portions. 1. Heat oil in a large saucepan and fry onions, ginger and garlic until soft. Add sweet potato and spices and fry until aromatic. Reduce the heat. 2. Add lentils and tea and cover with a lid. Simmer for 30-40 minutes or until lentils are cooked. Preheat the oven to 180 ˚C. 3. Add raisins, vinegar and salt. Season with lemon juice and pepper. Spoon into an oven dish. 4. Mix eggs and buttermilk and season with pepper. Pour on top of the lentil mixture. Place bay leaves in the egg mixture and sprinkle with almonds. 5. Bake for 30 minutes or until golden brown and cooked. 1. Place beans in a large bowl and cover with 3 cups (750 ml) cold water. Soak overnight, drain and rinse. 2. Heat the oil in a large pot and fry meat until brown. Spoon out. 3. Fry onions, celery and carrots in the pot for a few minutes. Add ginger, garlic, dried herbs, cloves and bay leaves and fry for another few minutes. 4. Add the beans, meat, salt and tea and stir through. Simmer with a lid for 1½-2 hours or until the meat and beans are cooked. 5. Stir in the tomatoes, cauliflower and spinach and simmer with a lid for 15-20 minutes or until just cooked. Add more tea, if necessary. Season with lemon juice and pepper and stir in the parsley. 1. Heat the oil in a large pot and fry chicken until brown. Spoon out. 2. In the same pot, fry onions, carrots, celery and baby marrows until brown. 3. Add chicken, tea, water, rosemary, bay leaves, barley and salt. Reduce the heat. Simmer with a lid for about 20 minutes or until the chicken is cooked. 4. Spoon out the chicken. Cook the soup for 40-45 minutes or until the barely is soft. 5. Meanwhile, debone chicken and shred the meat. Add back to the soup once the barley is cooked. Season well with lemon juice and pepper. 6. Stir in the parsley and serve hot. 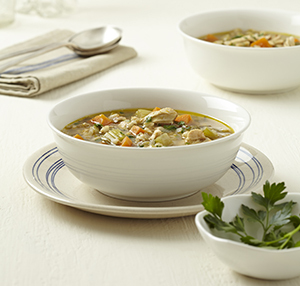 Serve this soup on its own and don’t be tempted to make bread part of this meal. The barley has enough carbs to make it filling. Rather bulk up by adding more green veggies to the soup if preferred – broccoli or spinach will be delicious. The roasted flavour of two everyday ingredients combined with cumin makes this a special side dish. 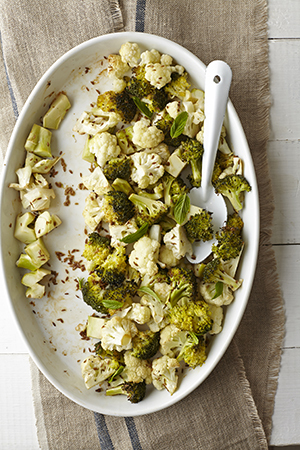 A low-carb veggie to fill your plate with. 1. Preheat the oven to 200 ˚C. Place veggies in a large bowl with the rest of the ingredients, except the mint or parsley. 2. Toss to coat the veggies with the seasonings and place in a large oven dish. 3. Roast for 15-20 minutes or until just cooked. Stir in fresh herbs and serve hot or at room temperature. Serve as a green veggie with pan-fried, grilled or roasted fish, chicken or meat of your choice. 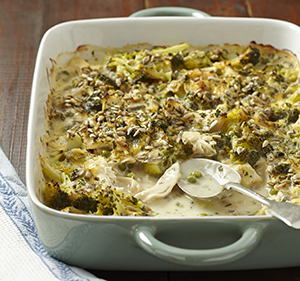 Enjoy a big portion of this side and add a moderate portion of another starchy side dish. Choose any of the recipes from the side dish section. 1. Preheat the oven to 180 ˚C. Mix all the ingredients, except the apples, tea and yoghurt, until well combined. 2. 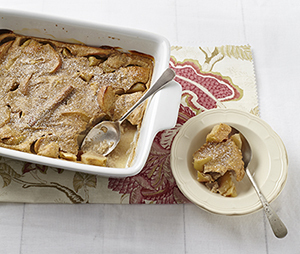 Place apples in an oven dish and fill with the coconut mixture and pour tea over. Cover with foil and bake for 20 minutes. Remove the foil and spoon over liquid. 3. Bake for another 10-20 minutes, uncovered, until just soft, but not burst open. The apples shouldn’t fall apart. 1. Preheat oven to 200 ˚C. Place apples, tea and cinnamon stick in a saucepan. Simmer for 7-10 minutes or until just tender. 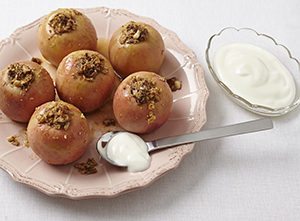 Spoon apples and tea into a lightly greased oven dish. 2. Beat buttermilk, milk, vanilla, eggs and lemon rind together. Stir in almonds, flour, baking powder, sugar and mixed spice to form a runny batter. Pour over the apples. 3. Bake for 30-40 minutes or until golden brown and cooked.